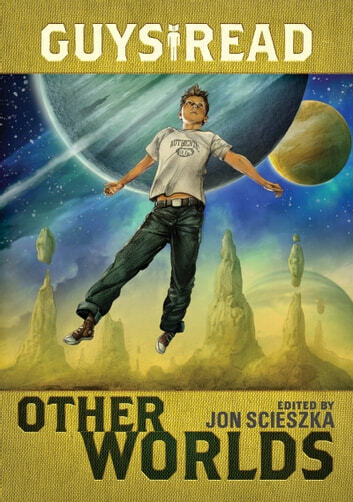 Other Worlds, the fourth volume in Jon Scieszka’s Guys Read anthology series for tween boys, features ten thrilling new tales of science fiction and fantasy from some of the biggest names in children’s literature. Prepare yourself for ten trips into the unknown, as ten of your favorite writers—Rick Riordan, who has written an all-new and exclusive Percy Jackson tale, Tom Angleberger of Origami Yoda fame, Newbery medalist Rebecca Stead, Shannon Hale, D. J. MacHale, Eric Nylund, Kenneth Oppel, Neal Shusterman, Shaun Tan, and none other than the late Ray Bradbury—spin tales of fantasy and science fiction the likes of which you have never imagined. Compiled by National Ambassador for Children’s Literature (and Secret Ambassador for the Intergalactic Alliance) Jon Scieszka, Guys Read: Other Worlds is sure to boldly take you where no reader has gone before.